Gary Edgley believes Boston Town learned some valuable lessons in their 1-0 defeat at UCL Premier leaders Daventry Town. A first-half finish was enough to settle the contest in the Purple Army’s favour. But after watching his side pick up only their second defeat in 12, Edgley looked to the positives. 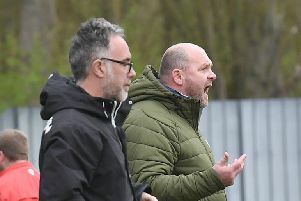 “Daventry are a very professional and experienced outfit so this was a good lesson for my young lads to take on board for next season - even hearing their manager shouting at his players ‘they are only kids’ at one point in the second half was quite funny,” he told bostontownfc.co.uk. “I said to my players I would also learn a lot today, not only from playing the league leaders and what is required as a team to be at the top, but also from my players - and I did. “I was very happy with the attitude they showed and the commitment they gave me. Also, I had a few of my players that really stood out and I was looking to see which ones would. “From the game I can see that as a club we are moving in the right direction on and off the pitch. The Poachers return to action on Saturday, hosting third-place Rugby Town (KO 3pm).